On this episode we talk with Greg Scown, founder of Smile, which is behind apps such as TextExpander and PDFPen. Greg discusses how he got his start, why you should include time for curveballs in your product launch, and the modern day role of conferences. He also covers how to handle competition, lessons learned from acquiring software, and much more. Alexis: Greg, thank you for coming to the podcast. Greg: You’re very welcome. I’m excited to be here. Alexis: So before we get down into the rabbit hole of Smile Software, TextExpander and PDFpen and then iOS apps and the Mac Store and all this good stuff, let’s start with yourself. Give us a bit of background on yourself. Greg: Sure, I’m originally from Pawtucket, Rhode Island and I got involved in computers around age nine. In fact, it was kind of funny. My father moonlighted teaching investments at a little community college and they did a stock market game. I was fascinated with this; I played the game and really enjoyed it. I convinced my dad that I should invest a portion of what I had in my savings. So being a kid, and the wisdom is invest in what you know, I bought some shares of Ideal Toy Company. About six weeks later Ideal Toy Company came out with this neat thing called The Rubik’s Cube, so I tripled my investment and made enough money to buy a computer, which was really what I wanted to do at the time. I hadn’t really anticipated it working out quite that well. Alexis: Before we get too far from this investment thing, I have to stop you here. Did you continue your wild investment streak? Greg: I have not continued my investment streak with that degree of success but I am a lifelong investor. That is true. Alexis: Okay, I just want to make sure because you can send me an email whenever you feel good about a toy company. Greg: I’m pretty sure that stuff would go directly to spam [chuckling]. Alexis: Alright, so you got your first computer. Greg: Yes, it was a TRS-80 core computer hooked up to my TV. That was how I got started. Fast forward a bit, graduated high school, I came out to California to go to school. I took a degree in Computer Science from Stanford which kept me out here. I did an internship with Apple my junior year and went to work for them in my senior year – after I graduated, rather. I worked for Apple for four and a half years. My last 18 months, I ran a small research and development group in mainland China. Greg: That was really fun. They closed the development group because it wasn’t exactly great financial times for Apple but it was a fantastic experience for me and I really enjoyed it. We actually managed to ship several things from that site, so that was fantastic. Alexis: Was that Chinese language stuff? Greg: It was actually general purpose. There were two groups there. There was a group that was doing Chinese language software and I was no expert in the Chinese language so I was no help to that group, but I did help with engineering practices and such. The other group did generally software so they did a Kodak image format plug-in for QuickTime, we did File Exchange 3.0, which was the system software that managed reading and writing PC desk formats on the Mac. I’m pretty sure we did on other thing, but it escapes me at the moment. It was just fantastic to be able to ship software. I worked in Cupertino for three years and shipped nothing, then I worked in China for a year and a half and I shipped three different products, so that’s fantastic. Alexis: What led you to think, “I want to strike off on my own and I’m going to build my own software.” Was that an immediate thing after Apple? Greg: Apple drove me to it, seriously. What happened was, I had led a group of eight people and shipped software. At the time I was 25 years old. I got back to Cupertino and started looking around for a job. No hard feelings obviously; it was a great experience. I left, I made my first attempt. I worked for a year and a half on a product that didn’t quite achieve its goals and didn’t ship. To put it in another way, we failed [chuckles]. I tucked my tail between my legs and I went back to work for two years to make enough money to try and do this again. Then in April of 2002, while living in Beijing, I shipped PageSender which was fax software for the Mac. That was my first product and it was a relative success. Alexis: I hate to go back but I always find it fascinating when folks try to make their whole independence work, and then it doesn’t work for the temporary moment, but then they go back to it again. So in that interim time, were you doing freelance work or did you work for another company? Greg: In the interim time, I went to work for an Internet startup. It was the winning end of the Internet boom. They were still out there, they were paying very well and they were willing to take a chance on somebody without direct experience inn what they were looking for. Alexis: It’s just the way it happens here. Greg: Yeah, I was along for the ride and knew it, but I was okay with that. We certainly all worked hard and I learned a lot in the process. So by that point I was ready to give it a go again. Alexis: Alright, so you’ve shipped PageSender. Was that a hobby? You said you were ready to give it a go again. Was it, “Okay, I’m done and I’m diving into this full-on”? Greg: Maybe it was crazy at the time but I fully expected I was going to make a full-time business out of it, and I fully expected it was going to be my source of income. Alexis: Well, it worked out in the end. Greg: Yeah, wow I realized there was a fair amount of hubris involved [chuckles]. Alexis: Sometimes there has to be, I guess. Greg: I suppose if someone else is listening to this, the advice would simply be – if that’s your goal, then go for it. Don’t let anyone else tell you that you’re being silly or crazy – you’re not. Just don’t be silly-crazy in terms of making sure you can cover your finances and you can provide for your family. Alexis: Right, and if you’re single? Greg: Yes, that certainly didn’t hurt. Alexis: You have more time to be crazy. Alexis: You shipped PageSender. How did that wind up turning into full-time work? Greg: I shipped PageSender and I was cash flow positive within about a month and then managed to add features and listen to user requests. Within six months, it was evident that I was going to be able to continue to do this full-time if that what I wanted to do. I certainly wanted to do it, so I packed up from Beijing, I moved back to the US and mounted a presence at MacWorld in January of 2003. Alexis: Actually, this is I guess more of a forward-looking question, and partly – I hate to call it historic because it’s not far away. Conference and conventions seem to be less important than they were in 2003 or so. How does that factor in terms of going to conferences now? Is it still something you think that’s worthwhile? Greg: I think that the audience and the goals are different. In 2003, the return on investment from mounting presence at Macworld was enormous. It was like 1000% – it was just crazy. If you weren’t there, you didn’t exist, and on top of that, you were leaving money on the table. You’re an idiot – in the jocular sense of the word. That was the way things were then. Nowadays, mounting presence at a conference or a tradeshow is essentially negative ROI, but that depends on how you calculate. It’s not going to give you the gangbuster sales and door special and the things you could do before. However, it does give you exposure to the community and you meet people, and suddenly you’re sponsoring their podcast because you know who they are. That sort of stuff really helps. So I wouldn’t count them out. I can’t say I’m too surprised that Macworld‘s taking a year off and rethinking what they’re going to do, but would not surprise me if another event or Macworld reincarnates itself as something a little bit different. Recognizing that people can get information about products readily now, they don’t really need to trawl the show floor for that. What they do need is a place to have a community together and to congregate and meet and share ideas and learn. Alexis: So it’s more about setting expectations than anything else? Greg: I think so. I think someone is going to some along and make something pretty neat. I don’t know if it’ll be IDG or not, but I certainly wouldn’t count them out. I think that they’ve done a pretty good job adapting in recent years, especially with the Macworld conference. Maybe what they will wind up doing is having a much expanded Macworld conference, no show floor at all and vendor participation in the form of education and in the form of meet and greet, and probably in the form of sponsoring events. Alexis: Going back to PageSender, how did that lead to Smile Software? So he did, and we had dinner and several phone conversations over the ensuing weeks. I had a product idea that I wanted to pursue – that ultimately was DiscLabel – but I didn’t have time to do it because I was beholden to my PageSender customers and on top of that, PageSender was how I was making money. DiscLabel would have been very speculative. It turned out that this was incredibly fortunate because my graphics background is relatively limited and Philip’s was superb. So it was the right person at the right time, the right product. Again, to people who are trying to look for lessons, gee, “have a lot of luck” is probably not a good lesson. I don’t know what to tell you there. We got together up in Portland in April of that year; we shipped this little 1.0 in July at Macworld New York – the final Macworld New York. We were cash flow positive by the end of the week as a combined entity. Again, that shows you the power of these tradeshows. The other thing is that by then, I knew how to ship a 1.0 product because I had done it at least once. That was how we got going and we had some help from Jean McDonald at that point as well. She was working on our website, our backend. Alexis: I’m curious, how did the name Smile come about? 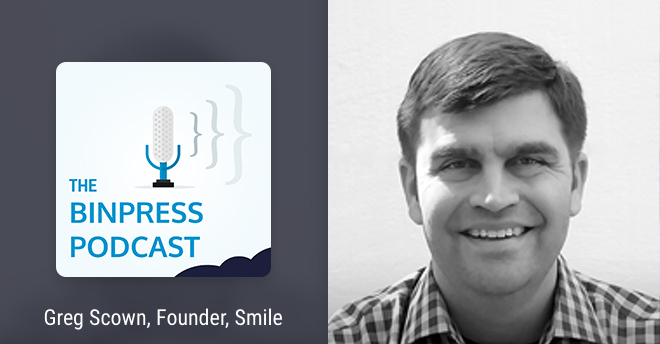 Greg: When I began Smile software, I was just looking for something simple and cheerful. Alexis: Yeah, that works. Somehow you Occam’s razor-ed it to land upon a really solid name. Greg: Yeah, and then Philip was on MyMac in his previous Mac endeavors and so when we combined forces, we became Smile and MyMac, and we stayed with that for quite some time. It was only maybe three or four years ago when we realized, “Gosh, we’re making iOS products now; calling ourselves Smile and MyMac is actually something of a deficit.” Fortunately we still had the domain name from before and so it wasn’t really that hard to become Smile. Alexis: That’s a good domain name, yeah. Greg: We don’t have smile.com, don’t worry. Greg: Yes, smilesoftware. Smile.com is owned by a retired tennis pro in western Massachusetts who makes six figures a year selling an interesting domain name. That’s how he does his retirement. Not really in our league, I’m afraid. Alexis: Let’s see, Smile Software is growing, it’s doing well, it became cash flow positive with that product in a week. What were some of the first growing pains that you faced and how did you solve them? Greg: I think our first growing pain was trying to produce the third product. We thought we had a pretty good formula going, we thought we knew what we were doing. We then produced PhotoPrinto, which was a scrapbooking product that have shared some interface elements with DiscLabel so we thought people who were using DiscLabel would be familiar with it. We thought it would target a smaller market, and it pretty much flopped. This isn’t to say that it was a bad product; it just didn’t scratch the right itch, and the timing wasn’t right. That didn’t work out. We then, in the subsequent year, released BrowseBack, which basically kept a visual representation fully searchable of your Internet history. That was a neat product. It long predated what’s going on in Safari now. The thing that we hadn’t anticipated was it was incredibly resource intensive. Then we spent some serious time figuring out, is this something we can solve or not? Unfortunately we came to the conclusion that I think it was correct, but still it was depressing. That the hardware at the time wasn’t really up to what we were trying to do, it really was only accessible on the top hardware. Greg: That wasn’t a big enough market for what we envisioned as a very mass market product. Alexis: Brief anecdote, I once spot a Power Mac G5 for about 250 bucks at the Michigan State University surplus store. It nearly matched the power of my newer laptop, my MacBook Pro. I was so happy and then a liquid cooling leak got it and it’s still on my desk, collecting dust. I’ll turn it into a barbeque. Greg: I was going to say, I think there’s a fish tank kit for that that looks really cool. Alexis: A barbeque one as well. That’s probably more my speed. Greg: Alright, here you go. Alexis: So another thing that I’m curious about is spreading the word. Macworld and these conferences seem to have been a big boost, but what did you do online and in other ways to spread the word of the software? Greg: Well, that has evolved over time. We had Macworld as sort of a big spot and earlier in the company we had user groups. We would go to user groups; we would also make contact user groups and send them a packet they could use if they wanted to do their own local demo. That worked out pretty well. We also worked very early on in podcasts, so hats off to Jean McDonald who recognizing that these were an up and coming medium. I believe the first podcast we sponsored was Your Mac Life. Greg: Yeah, there’s a blast from the past. Sean is still podcasting. That was really good for getting started. They had a sizeable audience that they built from scratch and they did very good work, so it was really a pleasure to work with them for several years. Alexis: When it comes to user groups, that seems like a thing that you have to really focus on volume because it would seem that there are a lot of small to medium sized user groups and you just got to keep blasting it out. I guess my concern would be staying focused and also optimistic about that kind of thing. It feels like it’s going to be a slog; you have to get in contact with all these groups but collectively it seems that they would have a big effect. Did you have any concern with that, and if you did, how did you keep yourself optimistic and keeping on reaching out to these user groups? Greg: I think the user groups thirst for material and so if you’re capable of providing them quality material, then they’re much more willing, interested in, what have you to listen to you. If you have something bit-sized for their newsletter, if you have an offer for them – I mean, we regularly give discount offers to user groups. Even now, we still maintain contact with user groups. I don’t think they’re as influential as they once were but the neat thing you’re able to do now is you can appear via Skype. You don’t have to fly to Cleveland in order to appear before the Cleveland Mac users group or to Long Island, to appear before LIMac. You can be there on Skype and they understand that this is more practical and on top of that, that enables the user groups to be selective on whom they want. Greg: Yes. I’m trying to think of things that we did. Well, Direct Mail. We tried Direct Mail. If you had no idea, we did a mailer back in the day that was a spectacular failure. What else did we do? The disasters probably don’t come quite as readily to mind now. You want to block them out; you know how bad they were. I’m thinking of other stuff that we did – frankly, online banner ads have just been an utter failure for us overall. There’s really only one site that we’ve had any success with there, and we’ve kept doing that but really in terms of a broad general strategy for software, it’s terrible for us. Frankly, if any of your audience are developers and have insight or mastery into that, then they should definitely give us a call or write us an email or hit us up on Twitter. That is an area that we’ve not really had any success with. Alexis: Alright. Well, listeners, you’ve just found yourselves a freelance opportunity. Greg: Absolutely, yeah, get in touch. Alexis: Smile software’s now about 16 people big? Greg: We have about 16 people who work with us in varying degrees and about nine of us are pretty much full-time. Alexis: So what were some of the first roles that you hired for? Greg: The first was marketing, so that was Jean. Then eventually she became a partner of the company, and then more recently she left to pursue App Camp for girls full-time. We also had some support. Jean was sort of the big position fill but we also have support and we had an engineer who worked on DiscLabel, so the ordering depends on how you count. What happened at the beginning was people started doing small bits of stuff for us part time. Then ultimately, that evolved into much longer term relationships. The fellow who worked on DiscLabel is now working on TextExpander and I think he’s been working for us for nine years. Then after a couple of years when we achieved some success with PDFpen, we brought onboard two additional full-time engineers who are working full-time on PDFpen for the Mac and PDFpen for iOS. Then recently we’ve added some QA and we’ve added another engineer who worked primarily on PDFpen Scan+. Alexis: What are some of the qualities that you look for when you’re hiring? Have they changed over time? Greg: First foremost for us is we need folks who are independent and capable of essentially managing themselves. I don’t mean with no guidance or direction, but I do mean that we’re not in an office setting, we all work from home, we’re distributed throughout the country and we have time zone differences as well. So it’s important for somebody to be able to get up and work through what they’re going to do for the day without an office setting or any external influence on that. That actually, as a starting criterion, really drives who we would look at. Alexis: You mentioned TextExpander a few minutes ago. The story of how it came under the Smile Software umbrella is pretty interesting I think. Tell us more about it. Greg: Sure, that was fun. Basically, when Apple transitioned from the Power PC to the Intel Processor, the TextExpander product that I was using at the time didn’t work on the Intel Macs yet. Although it was evident that it was going to happen eventually, the problem was I had to use this Intel Mac every single day, the developer machine to get our stuff running. It was nice to actually be able to do support for that machine and I was doing a lot more support at the time than now. Basically it was like cutting off my left hand; it was just horrible. I stumbled upon this alternative product which at the time was called Textpander. That was what I started using and I was really happy with it. Then I tried to pay for it. I got a rejection notice from Paypal, and so I wrote to the author and the author didn’t reply. About a week later, I was chatting with Philip and Jean in our regular meeting and I said, “Hey, why don’t we buy this? We’re looking for what to do with our next product; I use this thing all the time. I know you do because I’m the one who basically forced it on you. Can you not imagine that we could make this thing successful?” Not that it wasn’t at the time, although it depends on how you qualify success. Ultimately I wound up tracking down the author because he was a grad student at a medical research lab in Freiburg, Germany. I tracked him down –. Alexis: Did you fly out to Germany? The guy wrote back, “Yeah, absolutely. No problem.” So he did and within an hour, Peter got back to me. A day later, I got up early in the morning because it’s later in the day in Germany, and in my sweatpants and t-shirt over iChat, we hammered out the terms for a deal. I had already worked with Philip and Jean on what the parameters would be and if we got so lucky as to be able to go and we got to go. There’s a lesson in that one actually, which is if you think you’re going to do something, assume you’re going to do it. Get things in a row, don’t spend tons of time on things that are speculative. At least the fact that I had the parameters with my business partners on what I could and couldn’t do, and how I could and couldn’t proceed meant I was able to hammer out the deal that morning without ever going back, because it was within what I was able to do. I cannot tell you how powerful that was. It just really made it happen. Alexis: Let’s see, there are quite a few questions about TextExpander. Greg: One more anecdote to that, Peter Maurer who was the author of TextExpander, has become a lifelong friend. That was another incredible bonus that came out of this. Two years later, he was coming to WWDC and wrote, “Gosh, these hotels are really expensive, would you mind if I came and stay with you?” and I said, “No, not at all.” He was a household name by then [chuckles]. He came and stayed and then the next year, he and his partner Isabel came to stay and we swap countries every year now. This summer, they’re coming here, so we’re really excited. Alexis: I’ll find friendships by buying software [chuckles]. Alexis: I guess the biggest question for TextExpander for me is competition. TextExpander is, at least for me on the Mac, the brand name of text expanding software. There have been other apps that try to do the same thing; some for cheaper. I would assume some for more as well. How do you deal with competition? Greg: How do you deal with competition? You pay attention [chuckles]. It’s certainly worth making sure that you know your competition; you know what they’re doing and what they’re capable of. You know what you want for your product, you know what you’re trying to deliver for your customers, you try to avoid second-guessing yourself and you proceed. We got a little lucky along the way – note the recurring theme of luck. At the developer conference in 2009 when Apple introduced iOS 3, it came with copy and paste. We hosted a party for our developer friends –. Alexis: I remember that was a big deal [chuckles]. Greg: – and Dave Teare and Roustem Karimov were there from AgileBits, makers of 1Password – a fantastic product by the way. They said, “Okay, you’ve got copy and paste now, when do we get TextExpander?” To which we said, “Ah, err, uhm,” since we were just wrapping our heads around the fact that we might be able to do something. They said, “Either you are going to do it, or we are, so get going.” We looked at each other; they are actually serious, they haven’t had much to drink. They’re just dead on, they mean this. We were a little terrified because we’re like, they could decide this is their second product and they could do it. Their third product, I guess they did Knox as well. That got us going in that direction, so that was interesting – the rumor of competition [chuckling]. Alexis: The specter of it, of competition itself, is powerful enough. Greg: Yeah, definitely! Especially from the likes of Roustem and Dave [chuckles]. Alexis: One thing that I asked Keith Blount back over at Literature and Latte about Scrivener is that again it seems like the de facto long-form text editor that someone would use on a Mac and now on Windows – from the outside, how do they keep finding more folks? I guess this is related to marketing, because to me it seems like everybody knows about TextExpander. Who doesn’t use TextExpander? I always find folks who still don’t and that’s how it spreads. How do you make sure that you keep reaching new folks? Greg: Sure, we try to look for where are there audiences that we would like to reach. Podcasts have been pretty good for that because they vary a lot in interests and they vary in host personalities, so they’re very helpful in that regard. I can’t say that we’ve actually cracked this entirely; one of the things that we continue to spend time and effort on is how can we ensure that TextExpander reaches more people. That’s what we’re up to right now. Alexis: Pricing becomes a thorn in the side of many developers. In fact, I haven’t met a developer who says, “I love pricing!” How have you grappled with pricing? Greg: True, pricing is a challenge and it’s probably not the most fun thing that you do in the course of business. There are a variety of schools out there; one of the prevailing ones is that if people aren’t complaining about your pricing then it’s not high enough. I think that that is a bit glib but I think that there’s a little bit of truth to it too. I think that you want to be loved, and so one of the ways to be loved is to sell your software less than it’s worth, and that’s not a great way to do business. First of all I remember, how dare we even charge for TextExpander to begin with. That was its own controversy, but we’ll leave that one by the wayside. We also did raise the price on TextExpander over time. However, in the course of doing that we also added professionally done introduction videos, we added copywritten help, so we were doing things that both had a cost to us, which we had to cover and which added value to the user, much more importantly. When you add value, then you can increase the price of your product. But you should never increase the price of your product for the sake of doing so. I think you have to take a combination of the Paying Point Theory and the value that you’re providing. I’m not sure how you would state the Combined Theory, but it’s along the lines of, if customers aren’t complaining that you haven’t added value then you’re doing well. It’s something along that line. I would make a terrible business author or a self-help book author, so I should probably stick to software. Alexis: Hey, if you need a ghost writer let me know. Greg: Alright, I’ll keep that in mind. Alexis: I’m looking through my giant questions list; I’m trying to figure out the best path forward. Greg: Well, we hadn’t even touched PDFpen. Alexis: Oh yeah, getting close to that. Greg: PDFpen debut before TextExpander actually, in 2004. Greg: Yeah, so we have to reach back a little bit again. Alexis: Okay, let’s cast our memories back to PDFpen. How did that bubble up? Greg: We shipped PDFpen 1.0 at Macworld 2004. I have to apologize; I’ve done the history a bit wrong. We had our third product before we had our period of PhotoPrinto and Browse Back. PDFpen 1.0 scratched an itch that we had which was, we kept having agreements or contracts or things that were coming by fax and on paper. Initially all it could do – I don’t recall the exact features, but mainly what it could do was put your signature onto a document, help make it transparent and could add text blocks to documents so that you could turn around, fill in an agreement and ship it back to the sender. That just saved us so much time. We were small; we didn’t have time for the administrative overhead of print, scan and sign. Then it just barreled into a full-featured PDF editor which made sense because it’s something that people wanted. They wanted to be able to do things that were focused on daily things that an average user does every day at the course of running a business as opposed to trapping and CMYK separation. Those have their place absolutely. I grant Adobe’s tremendous success at that. They’re addressing the professional printing market, but the fact is that not everyone is not a professional printer. Alexis: Right, or wants to deal with the time that it takes to do all that. Alexis: So let me say congratulations on PDFpen 7.0 which just launched in January. Greg: Thank you very much. Alexis: So, speaking of software launches, how do you prepare? What is your checklist? I need to get all this done, and especially again in marketing and getting the word out. How do you get your ducks in a row? Greg: we have a giant spreadsheet, we have some amazing people. In particular right now, Maya Olsen is doing the bulk of the organization for the PR and marketing. She has capable assistants on the web from Shawna Lemke of Lemke Design. We have our list of all the stuff you got to get done, and it’s substantial. It starts about two months before we can even consider shipping something. We begin on that list and we start rolling through. Well, the help needs to be updated; the videos need to be begun. On top of that, all of the stuff gets compressed. I say we start two months out, but the fact is when the product is UI capable, UI ready, UI frozen where you can actually take screenshots, it tends to come pretty close to the release. We’re a small company, that’s how it goes. All of this stuff ultimately gets compressed into a very short timeframe. But there are stuff that can be done in advance. The press release was drafted well in advance, the feature set was known. Advice wise, make your spreadsheet and your list. Every time you finish, go over that list again and make it better. As you do that, you will find that it gets easier. It doesn’t get to be less work, but it gets to be more certain, maybe a little more comfortable. Alexis: Yeah, your future becomes a known quantity in a certain way. Greg: To an extent, yes. The fact is that you can’t predict whatever crazy curveball life’s going to throw at you. Usually Apple is the best at throwing those, “We’re going to have a new processor” or, “Everything has to be 64-bit by next Tuesday.” Those things are much harder to plan for. The only thing I would say with that is build-in some time for a curveballs, I suppose. Alexis: I can already imagine this spreadsheet – there are few blind spots for Apple curveballs which don’t come often, I think. Greg: They seem to come with a fair degree of regularity, enough that they merit a place in the spreadsheet for sure. Alexis: When it comes to reviews, if you’re talking to a developer and their interesting in launching their app with reviews, what’s the game plan that you would typically take? Like reach out to them, to reviewers a month ahead or a couple of weeks ahead and here’s what you need to send them in addition to the app. Greg: I think that if you’re doing a completely new product that a reviewer has never seen before, and you’re comfortable releasing some basics about that product in advance, then it is quite reasonable to quietly and behind-the-scenes make contact with known folks. Your favorite podcast hosts that you’ve been listening for years, pop them an email, or maybe a favorite writer, and begin that process. The fact is that most reviewers won’t review a product until it’s final. That’s certainly understandable because it’s not a final product; it’s not what their readers are going to see. You can come close to the wire with an accommodating reviewer. For example, on iOS I would say that Federico Veticci probably has the laser-thin deadlines of being able to prepare a review in advance to be able to check it against the final and to release it very promptly. I’m incredibly impressed with how he’s able to do that. For an upgrade to an existing product, really it seems to me that you can get in touch with folks the day you release because they know your product and then they’ll slot you into their calendar if they’re interested in barring something that’s incredibly newsworthy. Alexis: Alright, let’s see. Tons of questions here, I want to make sure I get the important ones. Greg: I think I actually have an example of where an existing product you might actually get into the fray a little ahead of time. We did that with TextExpander 3.0 for iOS with the custom keyboard. Keyboards were brand new. We were shooting to release on day one and we actually invited the folks that we knew who had reviewed the product in the past or expressed an interest in it to join the beta program. Normally they won’t, but some will. For this particular one, it was very easy to get everybody on board because keyboards were new. There was no way for them to be final prior to the day that iOS 8 shipped. It was clear that there was a raft of products, our own included, that were going to ship on day one. For that situation, being flexible really paid off. Alexis: Speaking of the change from desktop to mobile, what have you learned when it comes to adapting or changing to a whole another development platform, or a whole another platform that you have to develop for? Greg: It certainly been interesting. The good news for Mac developers transitioning to doing iOS work is that the bulk of the lower layer is common, and so if you’re doing the same product on two platforms then pretty much everything under the hood of your product can be common. As in our case, PDFpen has a common sub layer and TextExpander has a common sub layer that runs on both platforms, so that’s super handy. I couldn’t speak to trying to do something, say, for Android, where you’re switching language, you’re switching tools, you have to test against enumerable devices. I have immense respect for the people who do that. I don’t think that we necessarily have the skill set in-house to do it. We’d have to partner up with somebody if that was what we wanted to do. Alexis: How do you deal with feedback? Lots of developers that I’ve spoken to say, “Yeah, I listen to it” but there is always something like a mental firewall that they put up, where they really have to consider what users are wanting here. Greg: Customers are your bread and butter, and so it certainly behooves you to listen to them. The classic example from our long-term history is that PageSender was originally was a wrapper for the print dialogue, which would set up an e-fax and ship it out via your email client. That was what it did. It was only fax software in the loosest sense of the word, but at the time, a lot of small business and a lot of Mac business were using e-fax. It was the tool. Not that we didn’t know – we were well aware that moving forward that was where we had to go. But it wasn’t instant; it took some time to get there. When customers come to you and tell you this is what we desperately need and they do it in volume, it’s probably worth paying attention. Alexis: Now from a personal level, how do you manage burn out between managing the business and programming and everything that’s involved in keeping Smile Software afloat? Greg: That’s hard. Someone asked me, “Do you have work to do?” There’s only one answer to that question. The question is, “Am I doing it now or am I doing something else?” Develop a comfort level with doing something else. It’s very easy to be a complete workaholic. I doubt I’m the best person to give advice on that, I probably am a bit. Find stuff that you enjoy and make sure you that you make the time to do it because are you going to have on your tombstone, “I ran a software company”? Alexis: Well, at least one of the bullet points. Greg: Yeah, exactly. Fair enough. Alexis: How do you keep yourself organized considering there’s so much to do? Are you a big checklist person? How do you do it? Greg: I am a relatively a big checklist person. I use OmniFocus. I do not use it to anywhere its full potential my apologies to Ken and crew who just do a fantastic job with so much more than I could ever handle. I would look at his and say, “How on earth do you do that?” Of course he would turn and say, “Watch my three videos and I’ll teach you,” which would be the perfect answer. That’s largely how I keep organized. I’m a low inbox count person too; I try to keep that pretty minimal. If something is sitting in my inbox that needs attention, it needs to get onto a checklist and out of my inbox. Alexis: Alright, I really should be better about email myself. Greg: The maximum I think and maybe the thing that I find the most helpful to live by is that if you tell somebody you’re going to do something, do it. And if you’re not going to be able to get in touch with them to tell them why not. You are an example. I realized by last month – we originally scheduled to do this last Tuesday, and I realized by the beginning of last Monday that PDFpen 7.0 was really just going to take over my world. I was being optimistic I suppose, but hey, hope springs eternal, right? So I got in touch and said, “Would it be okay to switch this to next Tuesday?” and I also said, “If we need to do it Tuesday because that’s all the time you’ve got, I’ll be there.” And you were kind and flexible. That’s how most of these interactions work. But had I not been available that Tuesday, or had I wrote you three minutes before the podcast, I expect you would have been very upset, probably annoyed or at least you would have every right to be. That’s the difference in terms of getting stuff done. Alexis: Right. In terms of focusing on getting stuff done and staying sane in the short term, how do you balance that with not getting lost in the short term, being able to figure out, “These are my long term goals for the product and for the company,” and how often do you periodically check in on those and make sure that you’re on track? Greg: We certainly make a point of clearing decks for a day or two every year for the longer range stuff. Then we also make a point every quarter of doing the same. On top of that, Philip and I who are presently running the company meet every week for an hour – approximately, whatever time it takes – to go over what we’re doing. That falls into short, medium and long-term items. We try to make sure that we have attention to them both on a regular basis and then that we carve out time to take attention to them, looking at the longer haul. I can’t say the long long-term is our specialty, but I think we’re getting better at the medium long-term. Alexis: Before we get to my favorite question, you don’t sell TextExpander on the Mac App Store completely because of Apple’s whole – was it text logging or key logging issues, right? Greg: Right, key loggers are prohibited in the Mac App Stores because key loggers can be a force for good or a force for evil. Certainly TextExpander, we consider a force for good. We don’t do things that would be in the force for evil category like ship all your keystrokes out over the network or things of that nature. But the fact of the matter is, we could, and that’s the level of permission that you’re granting to the system and we have to stake our reputation on that. The Mac App Store is unwilling to stake its reputation on that and I can understand that. That makes sense to me. Alexis: Now speaking of force for good, I need to pause here and say thank you because you have saved me an enormous amount of time with TextExpander. Greg: I’m delighted to hear that. I think we’ve also saved ourselves an enormous amount of time too. I think without it, we would find it very hard to do a small business on this scale. It just saves us a tremendous amount of time, so I’m delighted to do that, multiplied, for more people including yourself. That’s just fantastic. Alexis: “I wish they should change their stuff.” I have to wonder how that has affected sales. It’s tough to say because you can’t really compare when it’s not on the App Store. I guess as TextExpander 3.0 was, but how have you fared and how is it going with being on the App Store? Greg: I don’t think it’s a huge problem for TextExpander to not be on the Mac App Store; it would be nice. It’s certainly a place where people look for software and it’s certainly a nice straight forward system that already has their credit card built-in. It’s hard to argue with, right? But I don’t think we’ve been tremendously negatively impacted by not being there for TextExpander. I think if we had a productivity product that wasn’t there – if PDFpen weren’t there – I think it would have a considerably larger negative impact, not least because there are competitors there. In the case of the key logging ban being App Store-wide then we’re in pretty good shape – there aren’t other key loggers there. In the case of PDF editing software, well there are plenty of other entrants that would be there or that are there, and we could not afford to not be there. One neat thing is we ask people where they found us when they purchase from us directly, and the Mac App Store actually falls with a significant number in that questions. So there are actually a lot of people who find us on the Mac App Store but buying from us directly. We pay attention to where these rank, and it’s about the same as our ad in MacLife in terms of the volume at which it pulls. Our ad in MacLife costs money, we can take the money that that costs and get a rough idea of what the value of just being in the Mac App Store is. There are a lot of developers who complain about the 30% but really, you get back some of it. You’d be very surprised especially if you have a direct purchase version available. Alexis: That’s interesting, that’s something I hadn’t considered especially the fact that there are no software that does key logging on there. There’s not much to worry about in terms of competition or losing out on revenue. So now, my favorite question. What’s one mistake you’d rather not repeat? Greg: What’s one mistake that I would rather not repeat? I would rather not repeat being overly speculative on product development. I think that there is so much to do with what you have and so much to pay attention to that being overly speculative in that space probably wasn’t our best plan. I’m not saying don’t do it, but I am saying that it was a case of excessive hubris. We decided, we’ve done these three products, we know what we’re doing and we’re going to do another one, and another one. We flew way too close to the sun [chuckles]. No question. We were incredibly fortunate to be in that position. The fact that we thought that we would just keep going and stamping them out – I look back and think, “I believed that. No question.” That was a painful lesson and a mistake, I think. Alexis: On flipside, what’s a decision that you’re particularly proud of? Alexis: I would say that’s a good one. Greg: Really proud of that one. It was the right thing at the right time, and being ready to do it though. As I said earlier, it wasn’t just a case of it being a speculative thing that we’re interested in; it was a case of being ready to do it. And the other thing I feel really weird about in the course of this conversation and I want to take a step back and just take a moment. A lot of this is “I, I, I” – I am a one person in a team of 16 and without the amazing team that we have, none of these “I” stuff would even be possible. I have my moment in the sun here I suppose in terms of talking to you, but it’s important to acknowledge that having an amazing business partner like Philip, having had an excellent business partner like Jean, having Maya and Eric, Colin, Nat, Frank, Anderson and Angel, and then on top of that having folks that we work with including our ad agency and having Shawna working on the website –all of these people contribute to making us able to do what we do. So I just want to have a big disclaimer on all the “I”s – none of it’s possible without this amazing team. Alexis: Speaking of the team, how do you find all these amazing people? Greg: Luck [chuckling]. Some existing relationships and some luck. When we were looking for our first PDF engineer, you write up a job description which I suppose may seem obvious but it does need to be done. Then we posted it on our site, we tweeted about it and Daniel Jalkut picked up our tweet and retweeted to his audience and that was how Eric wound up finding us. Eric wrote us the best cover letter I have ever seen in my career. I used to do some hiring work; it was just fantastic. We had the good fortune to be able to reach them but you got to go out to your network, you got to ask your network to go out to their network and see what you can come up with. Alexis: Now you’ve gone and made me curious. Without going into too much detail because a cover letter’s very personal, but what made it so great? I think that each one of those was a paragraph in and of itself, they were well-written, so it was evident that Eric had not just written this, but he’d actually edited it as well. He didn’t just duff off an email; he took the time. It was all the more impressive because time, effort, quality and attention to detail went into it, which was exactly what we were looking for in a programmer. So demonstrating through your cover letter, that you’re what someone is looking for, is a pretty darn good way to get their attention I would say. Alexis: Now one last moment in the sun for TextExpander and how it came to you, have you done any more acquisitions with software or was that the only one? Greg: We have not to date, but we certainly keep our eyes open. Going through what’s out there and whether we think it would be something that we could integrate is an exercise that we do at least once a year and sometimes more often than that. I’m not really at liberty to go into who we thought about, but certainly we do go through that process and I’m sure we’ll continue to do so. Frankly, taking a product that you believe in and that you believe that is underperforming and making it perform is a fair amount safer bet than starting from scratch. Alexis: So the last question and potentially the hardest question for some, what’s your test editor of choice? Greg: My text editor of choice is BBEdit and has been for as long as I can remember. Alexis: I had a suspicion that it might be BBEdit [chuckles]. Greg: I’m a regular expression guy. Greg: I frequently have to do stuff like – for example, we’ll get a list of name, email, serial number from a promotion and I have to massage that into a format that we can use. Just being able to do that alone gives BBEdit such the edge for being where I’m willing to work. Alexis: Alright! Is there anything that I missed that you would like to get across to the listeners? Greg: I suppose the other thing to go with BBEdit is that now I find Marked 2.0 to be a really excellent companion because I’m not working in a WYSIWYG Markdown Editor but I have a WYSIWYG Markdown Viewer that goes perfectly with BBEdit. That’s my killer combination. Alexis: I don’t use a BBEdit but I do use Marked. I’m a happy customer of Brett’s. Alexis: So if folks would like to know more about Smile Software and all your software, where can they go? Greg: I would strongly recommend they hit smilesoftware.com. We offer free download trials of everything that we have. We offer fast and friendly support via email so if you have a question then by all means write us and let us know. We’d be delighted to have you give our stuff a try. Alexis: If we’d like to follow you on Twitter, where should we go? Greg: You should follow us at @smilesoftware on Twitter. Alexis: For us, you can follow us @Binpress and myself @alexissantos. You can share your personal handle too if you’re interested in sharing what you’ve had for lunch. Greg: Sure, I’m @macgreg on Twitter as well. Alexis: Thanks again Greg, it’s been a pleasure. Greg: Alright. Thank you, likewise. Alexis: For the listeners, we’ll catch you in – I guess now since we’re a bi-weekly schedule, not next week but the week after.